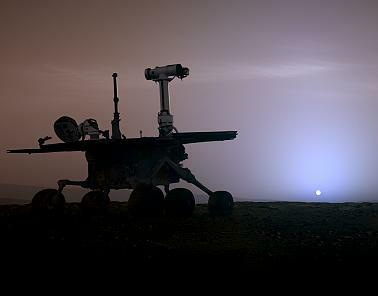 Two Rovers launched in 2003 actually made it to Mars. They completed their mission, but they're still roving today. This film tells their story. They were originally sent to help answer some pressing questions: "Did life ever exist on Mars?" And "Did Mars ever have what was needed to make life?" The first ten or so minutes of the film concentrates on the scientists and engineers and geologists who built these two little guys. A great deal of this footage is not actual Large Format quality and the ones that are spend too much time showing off a bunch of people in white jump suits. While the story is quite engaging, the images are just not what large format film is all about. And then, the computer-generated image of the launch to separation through all the interesting little stages a rover in its capsule experience -- this is a completely commanding experience. You will be holding your breath for the entire segment from launch to land -- simply awesome. The sequence is masterfully composed, directed, "shot," and timed. The timing is so wonderful, that it will tickle you. The film is almost worth seeing for this segment alone! The first third of the film is weak, but from there it blasts off with strength and connects emotionally, visually, intellectually and even motivationally with the audience. To hear these experts talk about all the mistakes and setbacks they endured and how much they themselves learned -- this is something, I think, that will inspire kids and adults alike. Roving Mars. Copyright © 2006. Produced by Frank Marshall at Buena Vista.